Superpowered teens seem to be everywhere you look at the moment. From the third time lucky reboot of the Spider-Man franchise, to the YA book world with series like Zeroes. 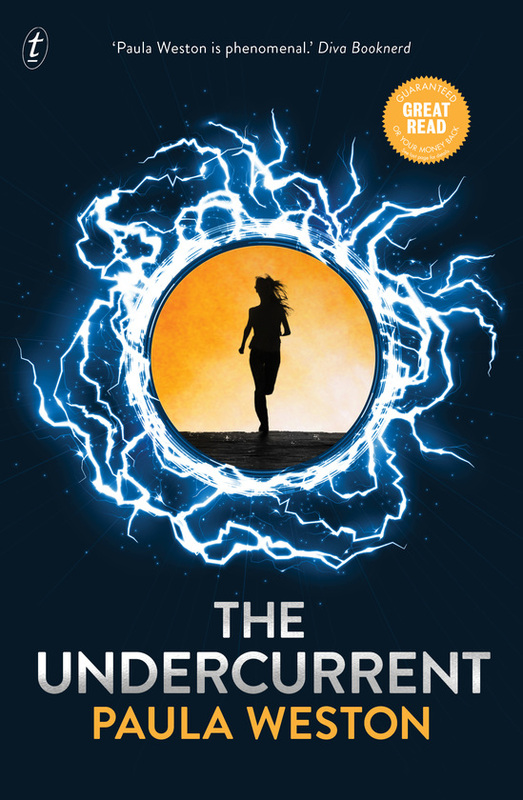 In the world of The Undercurrent there is only one superpowered teen – sixteen year-old Juliette DeMarchi. But as is “normal” in the superpowered teen world her ability to manage her powers quickly becomes a metaphor for growing up. The Undercurrent opens with a bang. An attack on the headquarters on mega corporation Pax Fed in Brisbane, where Juliette was going for an abortive job interview. When things go pear shaped, Juliette is rescued in a bit of a “meet-cute” by young soldier Ryan, part of a squad of soldiers sent to protect her. This is the set up for a tale of coming-of-age and corporate skullduggery. Juliette’s mother Angie is talked into going back into her old protest group, the Agitators who have become more extreme in her absence, to foil a plot to attack a nuclear power plant in South Australia. Meanwhile Juliette is sent into protection with Ryan on his family’s dying farm not far from the plant. Weston manages to ramp up the tension in both of these situations until they come clashing together in an explosive finale. This is down the line YA fare. The main character, Juliette has the power to harness and project electricity but she has little control over that power. She feels an instant attraction to Ryan and their bumpy relationship forms the heart of the novel while following a fairly well worn path. But The Undercurrent also has the bones of a technothriller with a big bad corporation, environmental issues, genetic mutation, soldiers for hire and plenty of weaponry. It’s also nice to see that even in the near future, life in outback Australia has not changed much and life on Ryan’s family farm and in his local community has a real lived-in feel. The Undercurrent does not break much new ground but what it does it does well. The characters are engaging, the revelations are well paced, and action scenes are cinematic. So that it is perfectly pitched for its slightly older YA audience. This review first appeared in Aurealis #103, Australian Science Fiction and Fantasy Magazine, www.aurealis.com.au.